Heisei is about to be over. Dave-sensei was on "Let's Enjoy English!" on Radio MOMO (79.0 FM) on Thursday. Dave and D.J. Chiaki Kamibeppu talked about New Year’s and New Year’s Eve. Click the button below to listen. Dave-sensei will be on Radio MOMO (79.0FM) with D.J. Chiaki Kamibeppu on Thursday December 27th at about 5:40 pm. They will talk in English and Japanese about New Year’s and New Year’s Eve. Have you ever seen a book like this before? If you look at the page the right way, you can see a 3D picture hidden inside the 2D image. It’s not easy at first, but the trick is to relax your eyes and look “through” the picture instead of focusing on it directly. The easiest way to do this is to put the picture close to your nose, then slowly pull the book away. It takes practice to get it right. I used to love these books when I was a kid. I got one as a gift when I was fairly young, and for a long time, I simply couldn’t see the pictures. I kept trying every day and eventually figured out the technique, and now I can see them easily. On Monday I had the chance-of-a-lifetime to spend a day working at a sake brewery (酒蔵) called 18 Zakari Shuzo (十八盛酒造) in Kojima, Okayama. It was hard work but very interesting and exciting. The brewery was started more than 200 years ago and has been growing ever since. 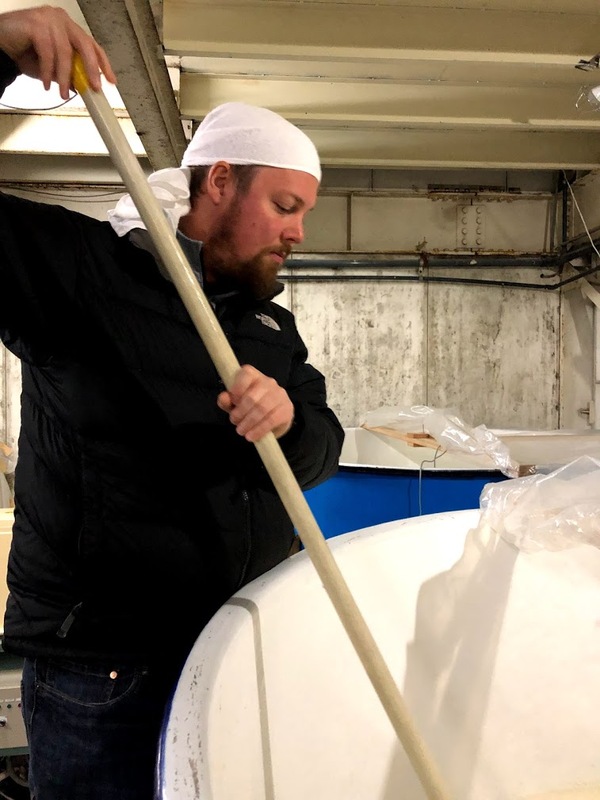 It’s still a small operation, with only about 10 employees, but everyone there clearly cares deeply about the art of making sake. I felt so lucky to be able to see them at work and help them make something they are so obviously passionate about. In the morning I was able to stir some of the tanks of sake that is being brewed right now, steam some rice, and then make some koji (麹), which is the fermented rice that is used to start a batch of sake (along with yeast, water, and more rice). In the afternoon we washed some rice, which was much more complicated and difficult than I expected! It required perfect timing and coordination between the brewers, and I made a couple of mistakes, which the brewers luckily fixed for me. Hopefully I didn’t hurt the taste of the sake! Thanks to everyone for having me! I can’t wait to try the sake I helped make! It should be ready in a few months. Last Sunday was NEO’s 13th annual Thanksgiving party. We cooked up the traditional American Thanksgiving dinner. We ate turkey, mashed potatoes with gravy, cranberry sauce, stuffing, candied yams, mixed vegetables and dinner rolls. And we also had dessert. We had apple pie, pumpkin pie and vanilla ice cream for desert. This year was our biggest party ever, 54 people! This year’s party was also very international, we had guests from 10 different countries: Japan, the USA, Canada, The UK, Australia, New Zealand, Malaysia, China, Germany and Austria. Here are some pictures of NEO staff and students enjoying the party.